One of Panthers’ title-winning former stars is delighted to see them back in the top tier of British speedway. Niels Kristian Iversen was a member of the famous Elite League triumph of 2006 – the first of his four seasons with the city club. Jack Holder is riding for Poole Pirates. The seven-time Danish champion, who returns to the World Championship series this year, has been based locally ever since and will be keeping a close eye on Panthers’ progress in the coming months. Iversen, who is not racing in the UK himself in 2019, said: “I think it’s great for the club to be back in the top league. It’s where I feel Peterborough belongs. “I have great memories of my time with the club and the track is one of the best in the country when prepared properly. Iversen expects his fellow countryman and Panthers captain of 2006 – Hans Andersen – to be one of the stars of the SGB Premiership season. And he is the ideal man to offer his opinion on the city side and their top-flight rivals. Iversen added: “I think Peterborough look pretty good. “Hans will be one of the top boys in the league in my opinion and I’m sure he’ll want to win things with Panthers again. “He had a good season last year even though he was in a Leicester team that struggled and he is good on all tracks. It doesn’t really matter whether it is big or small to him. “Rohan can be really fast as well and they look like they will always have strong reserves. “The league looks really wide open in my opinion. “Belle Vue are pretty strong on paper and Swindon have a lot of strength in their top three with Jason Doyle, Troy Batchelor and Tobiasz Musielak. “Poole won the title last year and have gone for younger riders at the top in Jack Holder and Brady Kurrtz who should still be able to improve some more. “We came close at King’s Lynn last season and myself not riding is the only change to their team so I’m sure they will be competitive again. “They are always strong at home and it’s just a question of whether they can perform on the road where Robert Lambert is going to have to carry a lot of the weight. “Wolverhampton are always good at home as well and they have a strong team. “Losing Jacob Thorsell to injury is a blow as he’s done a great job for them in the last few years, but bringing Scott Nicholls in certainly doesn’t weaken them as he has so much experience on all of the tracks. “Ipswich came up with Peterborough and they have a fairly solid team. 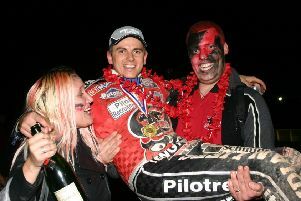 “Bomber (Chris Harris) really delivered for Poole last season as they won the league and he’s always exciting to watch. Team: Dimitri Berge, Dan Bewley, Kenneth Bjerre, Max Fricke, Jaimon Lidsey, Ricky Wells, Steve Worrall. Team: Jake Allen, David Bellego, Chris Harris, Cameron Heeps, Danny King, Richard Lawson, Krystian Pieszczek. Team: Kasper Andersen, Thomas Jorgensen, Lewis Kerr, Robert Lambert, Ty Proctor, Erik Riss, Michael Palm Toft. Team: Hans Andersen, Ben Barker, Lasse Bjerre, Rohan Tungate, Bradley Wilson-Dean, Charles Wright, one rider TBC. Team: Nico Covatti, Josh Grajczonek, Jack Holder, Nikolaj Busk Jakobsen, Nicolai Klindt, Brady Kurtz, Richie Worrall. Team: Troy Batchelor, Jason Doyle, Adam Ellis, Dawid Lampart, Tobiasz Musielak, James Shanes, Zach Wajtknecht. Team: Luke Becker, Kyle Howarth, Sam Masters, Ash Morris, Nick Morris, Scott Nicholls, Rory Schlein.